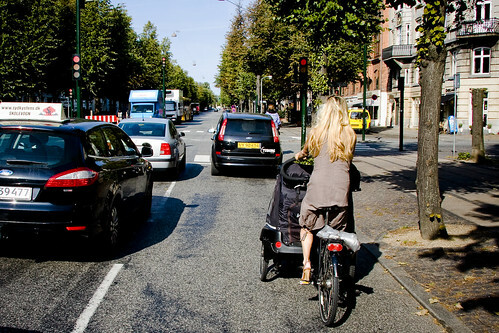 The Copenhagen version of the SUV moves gently and elegantly through traffic. Looks like he stole a basket from the Netto supermarket. I know these baskets are not cheap..
not cheap? made in china in the millions. i bet they cost about 25 cents each. 25c are you kidding me?? 10 $ would be my estimate. And even if they only costed 1 $ it is still stolen goods. A supermarket chain would not pay $10 for a basket from an Asian factory. There are hundreds of thousands of baskets in Denmark alone, that would hardly be cost effective. A simple bicycle bell costs about 10 cents from the factory. There are moving parts and a combination of metal and plastic. A plastic basket like this one is really only about 25 cents when you buy in bulk. And since supermarkets just tend to discard them when they are worn and dirty, I think that recycling is a good option. Especially when they are put to good, practical use. 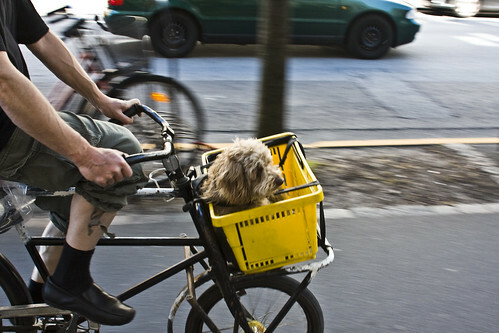 Someone: Put out an APB on a guy with a tat and a dog and unfortunate socks. Then report back to Jacob. "And your little dog too!"